In an apparent attempt to placate gun sellers and the gun lobby, the Bureau of Alcohol, Tobacco, Firearms and Explosives routinely allows dealers that violate gun laws to hold on to their licenses. 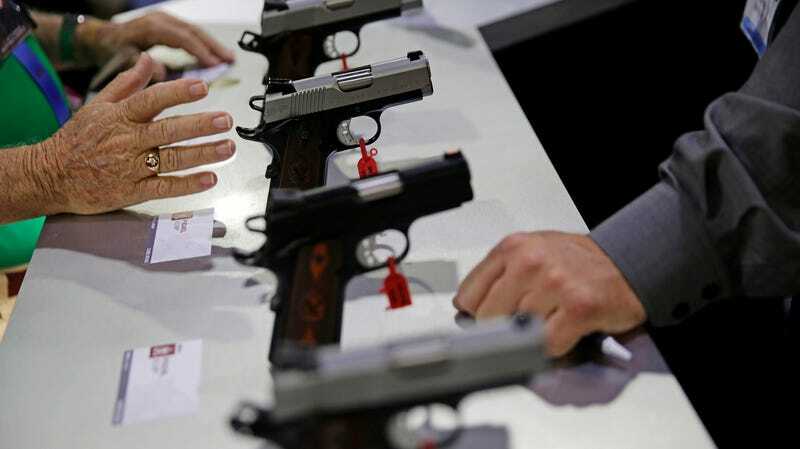 According to the New York Times, while most gun dealers are in compliance with federal law, the agency’s inspectors regularly recommend that non-compliant gun dealers lose their licenses, but their supervisors have repeatedly downgraded those recommendations to warnings, even if a dealer has already received several warnings. These violations go far beyond the routine clerical error made by a gun seller, which are often seen as innocuous as long as they are corrected. Instead, the Times report found repeat offenders who have sold guns to prohibited gun owners—like those with a felony conviction—as well as gun sellers who don’t run background checks, and yet they still have a license to legally sell firearms. One store was cited for failing to conduct background checks before selling a gun. Another store owner told investigators he actively tried to circumvent gun laws. One threatened an A.T.F. officer, and another sold a gun to a customer who identified as a felon. All were previously cited by the A.T.F. In each instance, supervisors downgraded recommendations that the stores’ licenses be revoked and instead let them stay open. Of about 11,000 inspections of licensed firearm dealers in the year starting in October 2016, more than half were cited for violations. Less than 1 percent of all inspections resulted in the loss of a license. The episodes shed light on the A.T.F.’s delicate role in policing the gun industry, which has historically resisted regulation and holds powerful political sway over the A.T.F.’s appropriators in Congress. Higher ups at the ATF allow irresponsible gun sellers continue to sell firearms with little more than a slap on the wrist. Regulation at work! At Gun World in Hilliard, Ohio, a dealer was found in 2016 to have repeatedly sold firearms to people who appeared to be prohibited from owning them, including a customer who self-identified as a felon. It is a federal crime for a felon to have a gun. An A.T.F. inspector recommended the store’s license be revoked. Citing Gun World’s “extensive noncompliance history,” the inspector’s supervisor agreed with the suggestion to revoke its license, according to a written report, but nonetheless downgraded the recommendation to a warning, saying it would give the dealer “one more opportunity” to get into compliance. Gun World remains open. When reached by telephone, an employee at Gun World hung up.